The Melbourne/Sydney rivalry will always exist. Whichever side you’re on, it can’t be denied they are two very different places. Sydney’s jewel is the harbour and the coastline stretching north and south of those magnificent heads. Melbourne has the Bay, and its own fairly spectacular set of beaches not too far away. But many would argue Melbourne’s social, shopping and music scene is a cut above Sydney even though, in the past couple of years, Sydney has stepped up the pace with its own series of hole-in-the-wall establishments. Liverpool and Crossley Street: Once a ‘lady of the night’ haunt, these two streets now offer less illicit delights. For bite sized Asian eateries Liverpool’s your best bet. Crossley will take you into the world of vintage shopping with a handful of popular lunch and dinner spots. Meyers Place: Just off Bourke Street, if you were going to spend time in one laneway, this would be it. Bar it, art gallery it, eat it. This is a strip not to be missed. 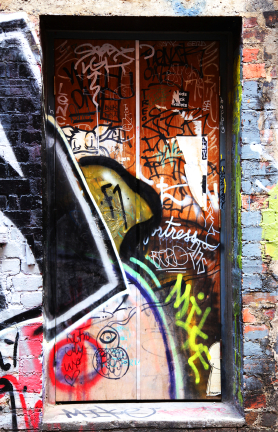 Street art collections: Impossible to name just one laneway, street art graces the walls of passages all over Melbourne. Much of the work is commissioned, turning brick facades into public art galleries that even give Berlin a run for its street art money. Some of the best examples can be found in Hoiser Lane, Union Lane, Cocker Alley (go here to see acclaimed Banksy! ), Caledonian Lane, Rutledge Lane and Spark Lane. That should keep you busy. Music lovers: If music in a confined space is what you’re after, especially jazz, make a bee line to Bennetts Lane. For a different feel, seek out ‘ACDC Lane’ or Dame Edna Place. Yes, it does exist. Hitting the shops: In each of the following laneways, you’ll not only find shops and boutiques to satisfy even the most committed shopaholic, but ‘watering and feeding’ pit stops along the way. You want to get to Manchester Lane, Equitable Place, Howey Place (a purely fashion), Scott Alley and Jane Bell Lane. The must dos: Degraves Street and Hardware Lane. 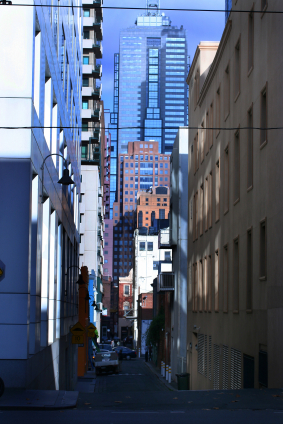 These are the classic laneways no visitor to Melbourne should miss. Think al fresco dining, coffee and hole in the wall shops and bars. China town: Last but not least, take a spin through the alleyways of China town for some dumpling delights. Head to Little Bourke Street, Tattersalls Lane, Celestial Lane and Market Lane. With all that under your belt there’s no excuse not to get to Melbourne and wander the eclectic and diverse laneways. Cheap flights in Australia are not hard to come by so, wherever you are, keep your eye out for flights to Melbourne and come and discover the true heart of the city. If all else fails, take yourself and some good walking shoes out and see what you can discover.